Environment Yukon's carnivore biologist is enthused about cougar sightings near Whitehorse, as tracks suggest the big cats are breeding in the territory. Environment Yukon's carnivore biologist is excited about a recent cougar sighting near Whitehorse, as tracks suggest the big cats are breeding in the territory. Resident Tim Schirmer says he was driving home down his long rural driveway around midnight one night in May when he says "two large objects practically leapt across the hood of my car." The Whitehorse high school grad got out of his vehicle and saw a large cat standing in the bush. By the time he got his camera out, a second cat appeared and he took the shot. "Then I got back in my car and got out of there," Schirmer said. 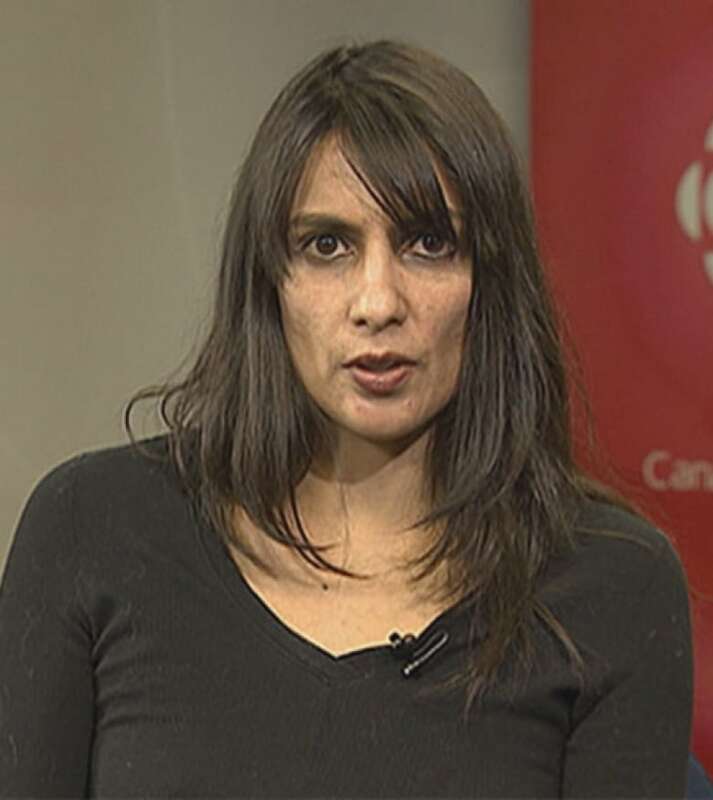 The May 22 sighting is great news for Environment Yukon biologist Ramona Maraj. The tracks they left suggest the big cats are breeding in the territory. "This is the second set of photos we've got," said Maraj, a carnivore biologist for Environment Yukon. 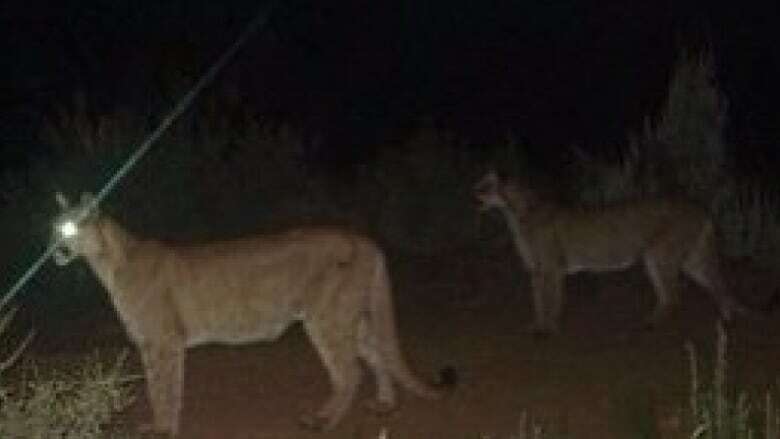 "Probably at least one of the cougars is a young one-year old, and so we know it's either a sibling pair or a family group." "That's very exciting because it means there is possibly cougars breeding in the territory." Maraj concedes she knows little about cougars in the territory. Ramona Maraj, a carnivore biologist for Environment Yukon, says the sighting of juvenile cougar could mean the big cats are breeding in the territory. (CBC)"Cougars are very hard to study, even in places where densities are higher. We know (in Yukon) that there are probably between 10 and 300, but that's quite a range." Environment Yukon officials get numerous reports of sightings each year but most cannot be corroborated. "I've personally confirmed one kill site that was a cougar," says Maraj. "We also have the cougar in Watson Lake a number of years ago that crawled into a car (and died) so we have the full specimen, so we have few bits of hard evidence now." Maraj says cougars, deer, and elk populated the Yukon thousands of years ago until glaciers pushed them south to warmer climates. Deer and elk have returned to the Yukon in significant numbers in recent years and cougars have followed. The first confirmed cougar sighting in Yukon was in 2000. "They have a predator-prey relationship," says Maraj. As for personal safety, Maraj says people travelling in cougar country should carry bear spray or a big stick for protection. But she says attacks on humans are rare, citing high density areas where there may have been just a single attack in the past 100 years. "It's not something to be paranoid or scared about. Just keep your wits about you," she advises. "But if a cougar attacks, one should always fight back. This is true for bears, too, if the attack is predatory, but all cougar attacks are predatory."